US Mint numismatic coin sales dipped, marking the third general weekly decline in four weeks. The excitement level of the 2009-dated coins is waning as eyes begin to turn toward upcoming series, like the America the Beautiful Quarters products, 2010 Lincoln cent and 2010 silver dollars — especially the Boy Scout commemoratives. Final sales figures for the UHR $20 Double Eagle Gold coin are now known. During their availability from Jan. 22 to Dec. 31, collectors purchased 115,178 of the 24-karat, .9999 fine gold coins. 2009 American Silver Eagle Bullion coins sold out earlier this week. In total, 29,134,000 left US Mint inventories, earning the 2009s first place in annual and overall sales across every other eagle dating back to the series launch in 1986. Companion 2009 Gold Eagle Bullion coins jumped 14,000 during the last seven days, bringing their January sales to 20,000. The Mint will not offer them much longer. Tuesday is the scheduled release for the one-ounce 2010-dated eagles — both gold and silver. First Spouse Gold Coins improved as a group. Collectors purchased a combined 407 compared to last week’s reported 330. Margaret Taylor gold proofs again led the pack, rising 152 versus 110. All collector sets (proof, uncirculated, etc.) retreated, with the exception of the 2008-dated Annual Uncirculated Dollar Coin Set. It registered slightly higher sales figures (1,269 versus 1,221). The no longer available Lincoln Cent Proof Set was actually set back by 1,107 to stand at an even 200,000. Taylor Presidential Dollar Coin Cover numbers are now available. 18,705 have been sold since their release on Dec. 30, 2009. The older Polk, Tyler and Harrison Presidential covers have respective sales of 21,971, 23,998 and 27,260. *As of Jan. 13, 2010. **Sold Out. *Sold out or no longer available. Click here for an entire listing of the most recent US Mint sales report. The collector coin sales figures above have an "as of date" of Jan. 10, 2010. 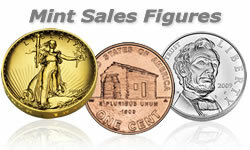 For an always updated reference of the latest articles, visit US Mint Sales.